A GAMER'S WIFE: Have You Seen My Husband? Have You Seen My Husband? I have to admit, I've had it easy. As big of a video game player as he is, K has never gotten involved in the major online multiplayer games, like World of Warcraft or Call of Duty, at least during the past 3.5 years that I've known him. Which means, even though he plays video games many-a-night, it's usually the single player campaign and can easily be stopped if something comes up. However, now that Monster Hunter Tri for the Wii is the first game in the series that allows US players to remotely hook-up... my husband is racking up the absentee hours! a) "Huh, what? Sorry, Brett was talking on Skype, and I can't talk to two people at the same time." b) "Ack!! Honey, not right now; the Lagi's killing me!" Hmm... interruptable gaming = very tolerable. Chatting with online buddies and being completely closed to communication from your wife for 2-3 hours every night during her prime waking hours = unacceptable. After about 3 weeks of this, we had a nice little discussion about balancing his extroverted need to hear live human voices during the day and my need to feel like I'm still the most important thing in his life. K's been very sweet and attention-giving to me ever since, so I think we're back to a happy equilibrium again. Thanks for the comments! It's so funny how gamers are so similar. 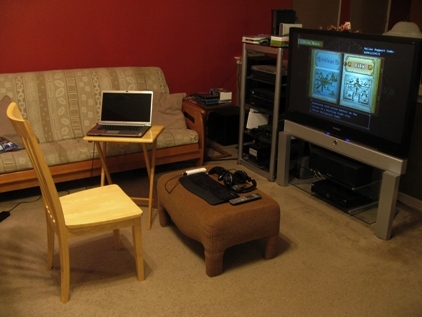 I seriously had never seen this "chair closer to the TV" setup; I thought a comfy couch would be much better, but apparently the back support and distance makes a lot of difference.